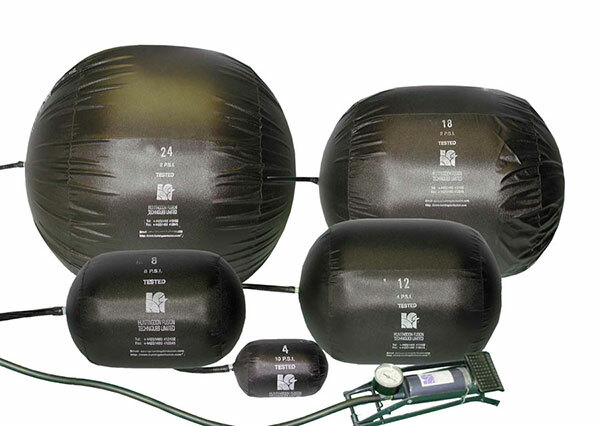 The Pipestoppers® Division of Huntingdon Fusion Techniques HFT® design and manufacture a range of Standard Inflatable Stoppers, which come in two formats: Cylindrical and Spherical. These versatil Standard Cylindrical and Spherical Inflatable Stoppers are used to service a wide variety of industrial applications and are an easy way to stop the flow of gas or liquid along a pipe or duct and to prevent the collection of debris or ingress of unwanted material or animals. Our Standard Range of Standard Cylindrical and Spherical Inflatable Stoppers come in sizes 1 – 96" (25 to 2,440 mm). 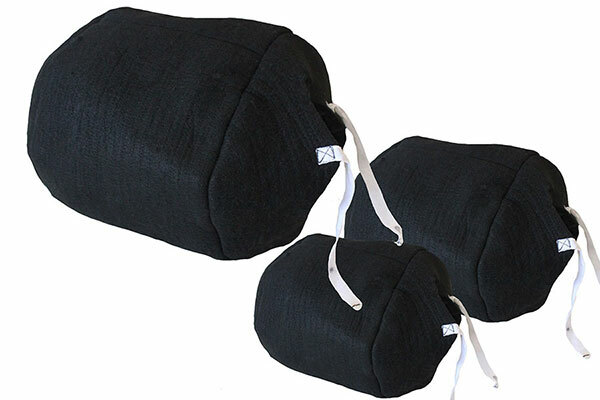 and are manufactured with a high quality, strong internal bag, covered in waterproof sewn polyurethane coated nylon. Each Stopper has a 1.3 m hose length, 10 mm ID, 12 mm OD and each are fitted with a standard Schrader Valve. 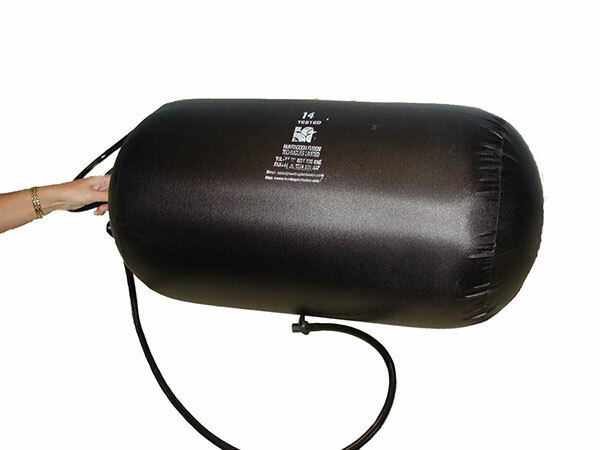 The recommended maximum temperature for the Standard Inflatable Stoppers to withstand is 90ºC (194ºF). 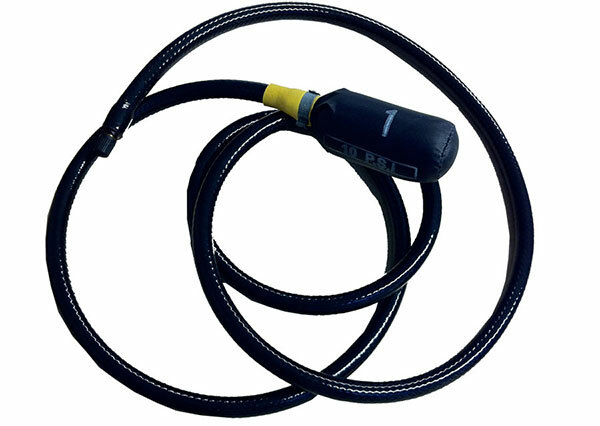 Inflation is carried out with a foot pump or air compressor. The Standard Cylindrical and Spherical Inflatable Stoppers, when deflated, can be passed through relatively small holes in pipes. This allows them to be used for many applications where access to the job site is difficult. On-site thermoforming of bends in ducting and conduit materials. Where only small entry ports are available. Isolating opening from environmental contamination. Sealing pipes and ducts during washing of factories and larger plants or products. Emergency plugging or isolation of drainage points. Sealing in pipes and ducts that are not to size. For difficult access voids or spaces. Closing off pipes to be kept clean during maintenance. Weld purging of closing welds where a small retrieval port is available. Weld purging to isolate large volumes in tanks, so minimum volumes are left for argon / nitrogen purging. The following are typical pressures, which the Stoppers can maintain a seal. Actual pressures will depend on various factors such as roughness of the contact surface and presence of lubricants. The Stopper material and alignment of the device can also have an effect on pressure. The maximum inflation pressure is prominently stamped on the casting. 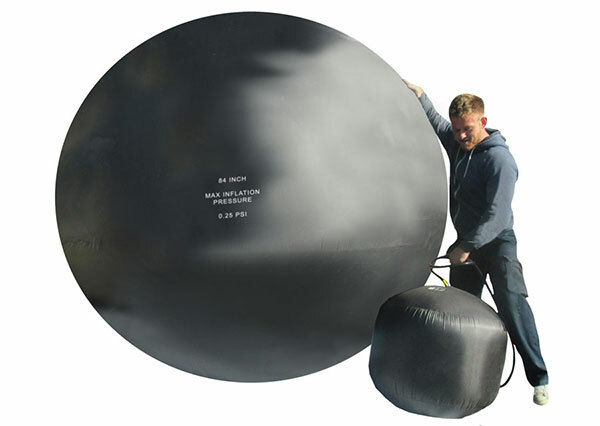 All Standard Inflatable Stoppers conform to BS EN 752, 1610, 295 – Low Pressure Testing and Sealing of Pipes. Optional foot pumps and pressure gauges are also available. Heat Resistant Covers are available as an accessory for the Standard Cylindrical and Spherical Inflatable Stoppers to suit all sizes within the range 1 – 96" (25 to 2,440 mm). 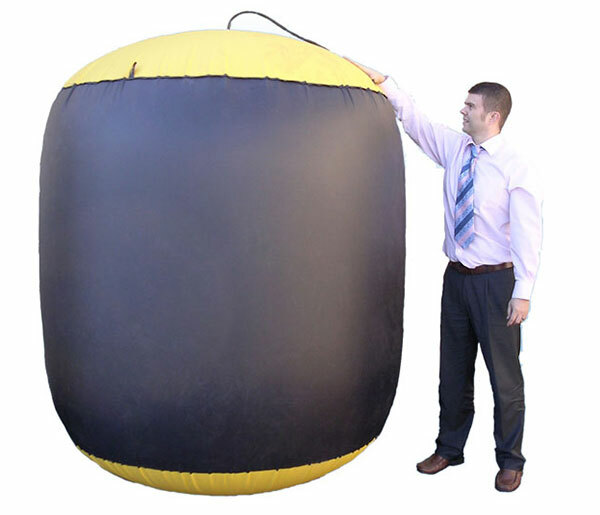 These specially designed robust Covers can endure high temperatures of up to 300ºC (572ºF), protecting the Inflatable Stopper, preventing them being damaged or bursting. Heat Resistant Covers can be attached to the Stopper easily with the ties that come attached and are reusable time and time again, without losing their heat protecting properties. PetroChem Stoppers for higher temperatures or immersion in chemicals. Low Profile Stoppers for applications where insufficient length of pipe is available for the Standard Cylindrical and Spherical Stoppers. Rubber Plugs for blocking pipes, tubes, dams, inlets, storage tanks and manholes. Special Stoppers can be manufactured to allow for pressure testing or sealing of irregular shaped products.